At BTME 2013 Dennis and Sisis will be exhibiting the Sisis Rotorake TM1000, this popular tractor mounted scarifier gives the user a combination of scarification and linear aeration allied with heavy duty power to control and remove thatch, reduce standing water and improve filtration. To maintain the ideal depth of scarification, the weight of the collection box and any material is absorbed by the main frame on the front roller, independent from the reel. 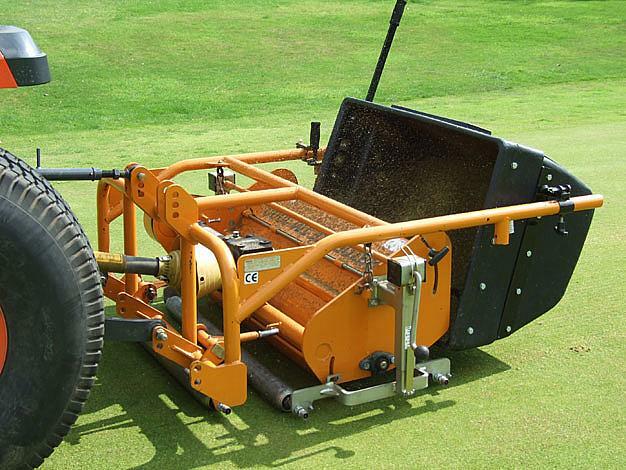 Available with either 1mm, 2mm or 3mm tungsten tipped blades and variable spacing options, scarification, verticutting & aeration can be completed while contra rotating reels ensure a clean and consistent groove. The floating unit affords fast ground coverage and working width and depth are 40mm and 50mm respectively. Also on display, the Sisis Autoslit purpose-built, easy to operate pedestrian slitter is ideally suited to outfield and fine turf work to aid compaction reduction and water percolation. A choice of interchangeable tines is available to suit differing ground conditions and leave minimal surface disruption. Working width and depth are 900mm (36”) and 150mm (6”) respectively. Power is provided by a 6.5hp 6:1 Briggs & Stratton engine. The easy to use Autoslit incorporates a rear smoothing roller and cantilever system to lift easily out of operation. The Dennis range on show includes the Razor Ultra 560 mower developed for golf greens and tees, cricket pitches and bowling greens. The eleven blade cutting cylinder is relief-ground for improved cut quality and longer inter-grind intervals. The Razor Ultra 560 also incorporates heavy duty independent cutter and roller clutches for smooth take up, an ultra-short wheelbase for undulating greens work, tungsten tipped groomer to cut lateral grasses prior to cutting and quick height adjuster. Cut width is 560mm (22”) and the Honda GX120 easy start, long life engine, with Q9 technology, ensures low noise & vibration levels. The Razor Ultra 560 is also available with a seven bladed cutting cylinder, T-bar or loop handle option and powered transport wheels for fast transit between greens.